For other people named Scott Dixon, see Scott Dixon (disambiguation). Scott Ronald Dixon MNZM (born 22 July 1980) is a New Zealand professional racing driver. Competing for Chip Ganassi Racing since joining IndyCar, Dixon has won the championship five times: in 2003, 2008, 2013, 2015, and 2018. He also won the 92nd Indianapolis 500 in 2008 from pole position. With 44 wins, Dixon has the third highest winnings in American Championship Cars history (trailing only AJ Foyt and Mario Andretti), and is the leading active driver in the current IndyCar Series with 43 wins. He is also a two-time overall winner and one-time GTLM winner at the 24 Hours of Daytona. Dixon was selected in a worldwide poll among fans as one of the 33 greatest drivers in Indianapolis 500 history. Among other notable awards won by Dixon are the Jim Clark Trophy (1999, 2001, 2004) and the Bruce McLaren Trophy (2003, 2008). In the 2009 New Year Honours, he was appointed a Member of the New Zealand Order of Merit for services to motorsport, and he was New Zealand's Sportsman of the Year in 2008 and 2013. Dixon was born in Brisbane, Australia, to New Zealand parents Ron and Glenys Dixon who were both dirt-track race car drivers. The family returned to Auckland in New Zealand when Dixon was very young. He grew up in Manurewa, a suburb in south Auckland and was a student at James Cook High School. Scott began racing karts as a seven-year-old, and caught the attention of the New Zealand public when granted a special dispensation to obtain a competition licence to race a saloon car as a 13-year-old. At the time of this dispensation, New Zealanders could not obtain a road licence until turning 15 years old. Dixon was competing at Pukekohe Park Raceway in a one-make series featuring the Nissan Sentra when he rolled the car onto its roof. He caught national attention when TV showed him struggling from the upturned car with a cushion strapped to his back to enable him to reach the pedals, and wiping a tear from his eye. In 1994, he won the New Zealand Formula Vee championship, before taking the Formula Ford Class 2 series in 1995 with 13 wins from 14 races, and then the full New Zealand Formula Ford championship the next year. In 1997 Dixon decided to race in the Formula Holden category in Australia. With no money to carry on racing, Rotorua businessman Christopher Wingate provided Dixon and his mentor, Kiwi racing hero Kenny Smith, with both money and airfares between New Zealand and Australia to ensure Dixon's career moved ahead. Dixon won Rookie of the Year and third overall in the 1997 Australian Drivers' Championship driving the Ralt Australia prepared Reynard. This resulted in him being offered a drive with top team SH Racing. As the budgets were going to exceed $250,000, Wingate suggested a company be formed to fund Dixon's career. That company was called Scott Dixon Motorsport (SDMS), funded by shareholders who over the next two years invested more than $1m[clarification needed] in Dixon. This allowed him to pursue his career without worrying about money. In 1998 Dixon won the Australian Drivers' Championship outright. That win brought offers to race in the Australian V8 Supercar series but that was not where he wanted to make his mark, so arrangements were made for him to go to the US to test in the Indy Lights series. 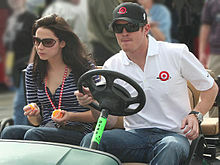 With the backing of Scott Dixon Motorsport investors, Dixon moved to the United States in 1999. After a test in Sebring where Dixon broke the track record on his eighth lap, he was signed to Johansson Motorsports Indy Lights team, beginning a long management association with the team's owner, former Ferrari and McLaren Formula One driver Stefan Johansson. He set a lap record when taking pole position for the Chicago oval race which he won. He was consistently fast throughout the year but had five DNFs, which limited him to fifth place in the series. In 2000 Dixon remained in Indy Lights, moving to the PacWest team. He took the championship in resounding fashion, scoring six wins and seven podium finishes. PacWest Racing graduated Dixon to its full CART team in 2001. Dixon immediately out-paced his teammate, the former Formula One driver Maurício Gugelmin. Dixon led his first race in Mexico for 14 laps. Just two races later he won at Nazareth Speedway – his first oval race in the senior CART series. At the age of 20 years, 9 months and 14 days became the youngest winner of a CART race, though the youngest winner of a major U.S. open-wheel race, belongs to Jimmy Davies who was six months younger when winning the 100-mile (160 km) AAA race at Del Mar, California in 1949. Dixon scored championship points in 11 of 20 starts, and led the FedEx Champ Car Series in laps completed with 2,521 out of a possible 2,610. He won the Jim Trueman Trophy for rookie of the year and was eighth in the championship. Dixon in his first year with Chip Ganassi Racing in CART. Dixon remained with PacWest, owned by Bruce McCaw of McCaw Cellular, for 2002 but it soon became clear the team was woefully short of cash due to the dot com crash. 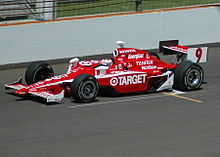 When it eventually collapsed, Toyota arranged an introduction to Target Chip Ganassi Racing which added a third car to its squad to accommodate Dixon. It was his first experience of a true top-level team, which had the then top engine supplier, Toyota. Dixon posted 12 top-ten finishes, including a second place at Denver. 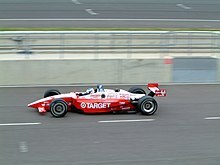 Chip Ganassi joined CART teams Penske and Andretti-Green Racing in 2003 to switch to the all-oval Indy Racing League. Dixon won the season opener at Homestead in Florida. A tangle with Tony Kanaan in Japan left Dixon with a shattered hand, but he recovered to take two more victories and win the championship at his first try. Along the way he also set a record with 343 consecutive laps led, the first time a driver had led consecutive laps in three successive races. At Pikes Peak he led the last 84 laps to win, then led every lap of the next event at Richmond, and at the next event, at Kansas, led the first 53 laps. Although it was his first year in the IRL, and he won the championship, Dixon was not eligible for rookie of the year due to his ChampCar experience. The year ended on a tragic note for Dixon. Ganassi had recruited Tony Renna as his teammate. The young American and Dixon were already close friends. At the Indianapolis Motor Speedway, during Renna's first practice session for the team, he spun across the track and became airborne in the third turn. Renna's car hit a post at high speed and was demolished, the cockpit splitting on impact. Renna was killed instantly of blunt force trauma to the head and chest. By 2004, the Toyota engine had lost its edge and Dixon did not successfully defend his title. In the 32 races held during these two years, Dixon made the podium only twice, with a second and a solitary win. He unsuccessfully tested for the Williams Formula One team, and finished 10th when representing the IRL in the 2004 International Race of Champions. In 2005 Dixon and his Ganassi teammates, Ryan Briscoe and Darren Manning, were struggling, and they wrote off or seriously damaged 28 cars in a long series of crashes. Manning was fired, and Australian Briscoe narrowly avoided serious injury when his car became airborne and disintegrated after touching another car and slammed into the outside retaining wall of Chicagoland Speedway's third turn. Amid rumours that Dixon could also be sacked, he bounced back to score his and the team's first win since 2003, the Indy Grand Prix at Watkins Glen International. Soon after, Dixon re-signed for a further two seasons with Ganassi. Ganassi moved to Honda engines for the 2006 season, when Dixon was partnered with Englishman Dan Wheldon, the 2005 Indianapolis 500 winner and IRL series champion. Before the IRL season even started, they successfully combined as a one-car team (with Casey Mears) to win the 24 Hours of Daytona. Dixon repeated his 2005 Indy Grand Prix win at Watkins Glen, and became the first driver to win an IRL race run in wet conditions. At Nashville Superspeedway, he won the Gibson Guitar Trophy by a couple of car lengths over his teammate Wheldon. He finished fourth in the standings, completing a series-high 2,504 of a possible 2,510 laps and being the only driver to finish every race, and finishing just 15 points behind Sam Hornish Jr. and Wheldon. Dixon was runner-up in the 2007 IndyCar Series season, 13 points behind Dario Franchitti. During the last event at Chicagoland, battling Franchitti for the win and the championship, Dixon was leading Franchitti on the last lap when he ran out of fuel, giving Franchitti the race win and the championship. Earlier he had achieved his fourth win of the year, at Infineon Raceway, and his third consecutive Camping World Watkins Glen Grand Prix. He had four-second-place finishes, including in the rain-shortened Indianapolis 500, and finished in the top-five in 10 races that season. He dominated the rain-delayed Firestone Indy 200 at Nashville Superspeedway, his second consecutive win in the event, and second consecutive win of the season. He won the next race, the Honda 200 on 22 July, to become the third driver in history to win three IRL races in a row, joining Wheldon and Kenny Bräck. On 5 August, Dixon was attempting to win a fourth straight race, at the Firestone Indy 400, when he was involved in a six-car accident. Dixon's crew repaired his car sufficiently to run two more laps, earning him series points but this ended his streak of 28 consecutive races – since retiring at the Chicagoland Speedway event in September 2005 – in which Dixon did not retire. This was a highly successful season for Dixon who won the series championship for the second time, and won his first Indianapolis 500, from the pole, to give car owner Chip Ganassi his second win in the race. He also won at Homestead, Texas, Nashville, Edmonton and Kentucky, a record equalling six wins for a season in the series. In the final points scoring race of the series, at Chicagoland Speedway, Dixon needed to finish no worse than eighth if Castroneves won the race. He placed second to Castroneves in a tight photo finish. Speaking to the media later he said it had been an amazing, unforgettable year. "Getting married, winning the 500, winning a championship in one year – not too many people can probably say they've done that." Motorsport.com took it further, saying that Dixon "can now say he's the 'best of the best' in American open-wheel racing, especially after this year's unification with Champ Car". At Kentucky he took his career laps-led tally to 2,149, becoming the fifth driver in the series to lead for more than 2,000 laps. Also at Kentucky, Dixon replaced Alex Zanardi as the winningest IndyCar driver for Chip Ganassi (16th victory), and his pole position achieved on 30 August for the Detroit Indy Grand Prix gave him seven for the year, and took him to second all-time leading pole-setter with 15. Also, he led 869 laps during the year, an all-time record for a single season. Just before the Chicagoland event, it was announced that teammate Wheldon would be moving to Panther Racing in 2009 and Dixon's new partner would be Franchitti who would return from NASCAR. For recording the IndyCar Series championship/Indy500 double, Dixon was selected 2008 New Zealand Sportsman of the Year at the Halberg Awards held in February 2009. Dixon was one of five New Zealand motor sports personalities honoured in a special issue of New Zealand Post stamps. Others featured were: Denny Hulme, 1967 Formula One World Champion ; Bruce McLaren, race-car designer, driver, engineer and inventor whose name lives on in Team McLaren; Ivan Mauger, six-time winner of the Speedway World Championship and voted greatest speedway rider of the 20th century; and Hugh Anderson, four time Grand Prix motorcycle racing world champion. At the start of the season, Dixon finished sixteenth and fifteenth in the first two races, at St. Pete and Long Beach. From then on he got to eight podiums, winning at Kansas, Milwaukee, Richmond, Mid-Ohio and Motegi, as well as a second at Chicago and thirds at Texas, Watkins Glen, and Edmonton. He led the most laps (73) in the Indy 500 but finished sixth. His dominant win at Mid-Ohio, by 29.7 seconds, was his 20th win in the IRL (21st of his career), making him the league's most successful driver. There was considerable rivalry between him and his friend and new partner in the team, Franchitti, who had returned to the IRL from NASCAR. Franchitti scored four wins, two seconds and two-thirds, and leading into the last race of the season at Homestead he was only five points behind Dixon. Complicating the issue was that Penske's Ryan Briscoe was only a further three points back, so whichever of the three drivers could win at Homestead would be series champion. Dixon started outside Franchitti on the front row and ran first and second with Briscoe for most of the race. However the two front-runners were forced to pit for fuel with only several laps remaining and the race win, along with the championship, went to Franchitti on a fuel saving strategy. Dixon claimed third in the race and second in the championship by one point over Briscoe. In the 2010–2012 seasons, Dixon won seven races and finished third in the championship three times (twice behind teammate Franchitti). He won at Pocono in July 2013, Indycar's first race there in 24 years, and Ganassi's first win of the year. He achieved back-to-back wins in the two-event Honda Indy Toronto. In the 2013 GoPro Indy Grand Prix of Sonoma, Dixon ran into one of Will Power's pit crew members, and was penalized. Dixon argued that the worker walked in front of his car, though IndyCar race director Beaux Barfield stated Dixon had driven into Power's work area. The next week at Baltimore, Dixon was involved in another incident with Power with 22 laps left, and officials ignored team requests to tow Dixon's car to pit lane for repairs. Dixon called for Barfield to be fired, and on 6 September, was fined $30,000 and placed on probation. Dixon won the double-header Houston Grand Prix and by finishing fifth at the season finale in Fontana he secured his third championship title. The year 2014 started well for Dixon when he was voted New Zealand Sportsman of the Year at the Halberg Awards, and he won two races and finished third in the championship. In the off-season, Dixon was third at both the Dan Weldon Karting Challenge and the 2014 Petit Le Mans endurance sports car race. He opened his 2015 season by winning the 24 Hours of Daytona for Chip Ganassi. Dixon's 2015 season started off slow with a 15th at St. Petersburg and an 11th at Louisiana. Dixon went on to win his first IndyCar race of the season at the Toyota Grand Prix of Long Beach. He won his second Indianapolis 500 pole and led the most laps at 87, but finished fourth to eventual race winner Juan Pablo Montoya. Dixon has an awful weekend to his standards at the Duel in Detroit where he got wrecked in the second duel by his teammate Charlie Kimball. Dixon rebounded and dominated the Firestone 600 at Texas which was his second win of the season. Dixon had average results in the Top 10 with a worst finish of 18th at Iowa, though this helped him since championship rival Juan Pablo Montoya went out very early. Dixon finished a 4th at Mid Ohio, his bread and butter track and a 9th at Pocono. Dixon went to Sonoma needing to win the race and have Juan Pablo Montoya to finish 5th or worse fora 4th Championship and accomplished it. He and Juan Pablo Montoya ended the season with equal points but with three wins to Montoya's two, he won the 2015 IndyCar Series season championship, his fourth. In the 2015 off season Dixon won the Dan Wheldon Karting Challenge Honoring Justin Wilson. Dixon struggled through the 2016 season. He had victories at Phoenix and Watkins Glen but was sixth in the championship, the first time since 2006 he did not finish in the top three. His sponsor, Target, withdrew at the end of the year, ending a 27-year relationship with Ganassi and 13-year relationship with Dixon. Opening the season with third at St. Petersburg, Dixon recorded his best finish there since 2014. He followed this with four consecutive top five finishes leading up to the Indianapolis 500. He won pole position for the race, the third in his career, setting the fastest pole time since Arie Luyendyk 21 years earlier. He was taken out of the race on lap 53 after Jay Howard cannoned off the Turn 2 wall. Dixon's car launched into an airborne flip, landing sidepod-first on top of the inside wall, crumbling the catch-fence and ripping the rear assembly from his car. Dixon walked away uninjured, but the incident caused a 20-minute red flag. He was second the following weekend at Detroit behind Graham Rahal, but at Texas Motor Speedway a week later he was taken out for the second time in three races. He, Will Power and Takuma Sato were closely racing with six laps remaining when Sato lost control and touched Dixon's car, spinning both of them off the track. At Road America, Dixon scored his first win of the season, beating Josef Newgarden by 0.5779s. Dixon finished third in the championship to first time champion Josef Newgarden and 2016 Champion Simon Pagenaud. Dixon began the year with a new full-time sponsor in PNC Bank adorning engine number 9. Dixon started off the year locking wheels and jumping over Takuma Sato at St. Petersburgh but rebounded to finish 6th. Dixon eventually recorded his first win of the year at the Duel in Detroit: Round 1. Dixon then went onto the next weekend to Texas and dominated again, redemption for last year after being taken out late. Dixon led 119 of 248 laps. After capitalizing on other drivers mistakes, Dixon went on to win at Toronto when he passed Josef Newgarden on the restart when he hit the wall. Dixon held off Simon Pagenaud and Robert Wickens to win. Dixon went on to finish 5th, 3rd, 3rd and 5th at Mid-Ohio, Pocono, Gateway, and Portland. At Portland, Dixon was involved in a lap 1 crash with James Hinchcliffe, Ed Jones, Sébastien Bourdais, Graham Rahal, and Marco Andretti who flipped over Dixon, Dixon sustained minimal damage when dirt was flying and the visibility was zero. Dixon rebounded and after a lucky break when his championship rival Alexander Rossi got an unlucky break. Rossi finished near the back while Dixon finished 5th in what could lead to his 5th Championship. In 2018 Born Racer: The Scott Dixon Story a documentary about Scott Dixon's early career and directed by Bryn Evans was released. Since joining IndyCar in 2003, Dixon has a career total of 14 road course wins, five street course wins and 19 oval wins. Of the oval wins, two came at tracks larger than 2 miles (3.2 km), five at ovals of 1 mile (1.6 km) or shorter and 12 at intermediate ovals. Of the road course wins, two came at Edmonton, an airfield circuit with significant enough runoff not to be a typical street track. The second win at Motegi for Dixon was at the road course track, unlike the oval track, they had used every other time. His four championship seasons have all seen differences in which tracks he was successful on. In 2003 Dixon won two consecutive short-oval events, then winning only two such events for the coming twelve seasons. Dixon then dominated the larger ovals in 2008, won three street course events in 2013 then followed by one street, one fast oval and one road course in 2015. In 2004 BMW gave Dixon a test drive in a Formula One car even while he raced with Toyota engines in the IRL. At the Paul Ricard Circuit in France, he drove a Williams and recorded respectable times during a one-day test, being not far off those of regular driver Ralf Schumacher. A two-day test six weeks later in Barcelona did not lead to a spot with the team. In July 2013, Autosport magazine named Dixon one of the 50 greatest drivers to have never raced in Formula One. * Season still in progress. Dixon married Emma Davies, a former Welsh and British 800 m champion, in February 2008. They have two daughters, Poppy Davies Dixon, born 5 July 2009 and Tilly, born several weeks premature on 10 September 2011. Dixon has been a long-term resident of Indianapolis, Indiana, and the mayor there declared 24 September 2018 "Scott Dixon Day" in the city following his fifth IndyCar title. ^ "New Year honours list 2009". Department of the Prime Minister and Cabinet. 31 December 2008. Retrieved 17 December 2017. ^ Stanley, Ben (17 September 2017). "Scott Dixon's journey from his Nissan Sentra to motorsport legend". Stuff. ^ "Champcarworldseries_biography:Scott Dixon". Archived from the original on 6 September 2006. ^ "Dixon relieved and ecstatic after title win". The New Zealand Herald. 8 September 2008. Retrieved 7 November 2011. ^ "Dixon Snatches Detroit Indy Grand Prix Pole". Archived from the original on 16 October 2012. Retrieved 4 January 2019. ^ "Vili wins supreme Halberg Award". Stuff.co.nz. 3 February 2009. Retrieved 7 November 2011. ^ "IndyCar Driver Dixon Fined, Placed on Probation". Fox Sports. Associated Press. 6 September 2013. Retrieved 6 September 2013. ^ Marot, Michael (21 May 2017). "DIXON TAKES 3RD INDY POLE WITH FASTEST SPEEDS IN 21 YEARS". Associated Press Auto Racing. Retrieved 30 May 2017. ^ "Dixon Taken Out Again". New Zealand Herald. Retrieved 15 June 2017. ^ "Scott Dixon − 2004 IROC Results". Racing-Reference. Retrieved 31 July 2015. ^ Malsher, David (24 September 2018). "Indianapolis mayor proclaims Scott Dixon Day in Indy". Motorsport.com. Retrieved 24 September 2018. Wikimedia Commons has media related to Scott Dixon.